Lectotype species: Arum maculatum L., Sp. Pl. 2: 966. 1753 (designated by M. L. Green, Prop. Brit. Bot. 186. Aug. 1929). Aron Adans., Fam. Pl. 2: 470 (1763), orth. var. Denmark, Great Britain, Ireland, Sweden. Krym, South European Russia, Ukraine. Linnaeus, C. 1753. Species Plantarum 2: 964. Boyce, P.C. 1993. The Genus Arum (A Kew Magazine Monograph). HMSO, London, 196 pp. ISBN 0-11-250085-4. Reference page. Boyce, P.C. 2006. Arum. A Decade of Change. Aroideana 29: 132–137. PDF. Reference page. Emonocot.org 2018. Arum in The Orders and Families of Monocotyledons. Published on the internet. Accessed: 2018 August 4. Govaerts, R. et al. 2018. Arum in World Checklist of Selected Plant Families. The Board of Trustees of the Royal Botanic Gardens, Kew. Published on the internet. Accessed: 2018 August 4.
International Plant Names Index. 2018. Arum. Published online. Accessed 4 August 2018. The Plant List 2013. Arum in The Plant List Version 1.1. Published on the internet. Accessed: 2018 August 4. Tropicos.org 2018. Arum . Missouri Botanical Garden. Published on the internet. Accessed: 2018 August 4. Farr, E.R. & Zijlstra, G. (eds.) 1996 onwards. Arum in Index Nominum Genericorum (Plantarum). Accessed: 2018 Dec 16. 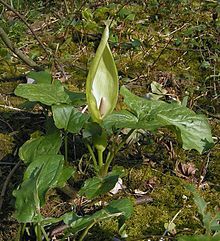 For more multimedia, look at Arum on Wikimedia Commons.